One of my dear childhood friends, Teresa, swung through Dallas this summer before heading back to b-school. She probably doesn’t know this, but she is one of the people that has positively influenced me to love cooking as much as I do today. She used to make THE BEST fried rice in high school for me. Now, I’m returning the favor and cooking for her. 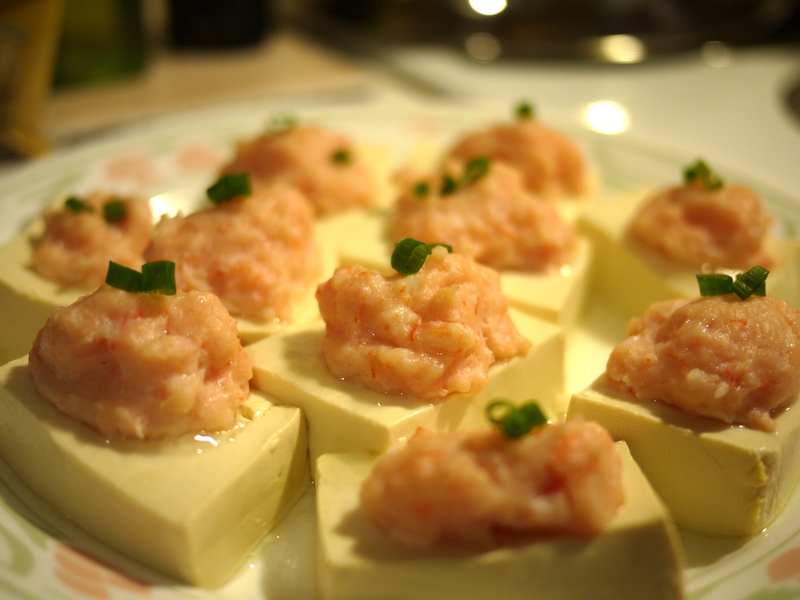 We made a bunch of things that I’ve had bookmarked for a while, including steamed tofu and minced prawn. The recipe we followed was taken from Christine’s recipes, which I have found extremely helpful in cooking Asian dishes. Put the shrimp, salt, egg whites, and white pepper into a food processor (or in my case, a blender, since I don’t have a food processor) until it forms a thick paste. Use a knife and cut open the tofu package. Gently cut the tofu into 2″ x 1.5″ x 0.5″ pieces and place on a plate. Use a paper towel to soak up any tofu juice on the plate. Sprinkle cornstarch on the surface of the tofu. Spoon the shrimp paste onto the tofu. Steam in a steamer for 6-8 minutes, or until the shrimp turns a nice pink color. Drizzle with low sodium soy sauce and serve hot. i just saw this! what a nice post 🙂 ❤ i'll share pics of my chinese new year feast with you this coming sunday. im cooking for 25 people…think i might be taking on too much? haha.